May 2019, Durham and Portsmouth, New Hampshire. I am struck with the sense one feels when they are witnessing a significant or profound event. Having gathered here with fellow members of the Broadband Forum to test our latest versions of the USP / TR-369 embedded Agents and Controllers, developers from AVM GmbH, Arris, Axiros, Nokia, QA Café and many others work through the day in a highly collaborative environment, setting aside the competitive drive which motivates their “day job” activities and succumb to the gentler nature of technology purists. Here, at the University of New Hampshire InterOperability Laboratory (UNH-IOL) – a modern, well-staffed 27,00 square foot facility educating engineering leaders from many disciplines – a Switzerland of Science has been created. The UNH InterOperability Laboratory is 100% industry funded through participating members, and participants of events like the Broadband Forum plugfest. The result is a unique environment where UNH-IOL staff and students, representatives of the Broadband Forum and industry technology innovators work through the day in a highly collaborative environment where the pursuit excellent is the goal, and the outcome is nothing short of an evolution of an important telecommunications and Internet of Things standard. The User Services Platform (USP), also known as TR-369, is a transformative development in the industry. In the laboratory at UNH, at wonderful group dinners in the beautiful neighbouring Portsmouth, replete with spirited conversations ranging from the history of brewing to nano-robotics, history is being made. Some of the original catalysis and visionaries of the new and evolving standard are still active in the work of taking an idea, creating advocacy, turning advocacy into action, and the original idea into science, and a new standard. Jason Walls of QA Café, himself a graduate of the UNH InterOperability Lab, recalls the earliest conversations which lead to the standard we now simply refer to as USP. QA Café, a fellow Broadband Forum member, has offices in Portsmouth, the picturesque seaside town known as the oldest settlement in New Hampshire and longtime residence of John Paul Jones (the patriot, not the bassist of Led Zeppelin). Producing test equipment for TR-069 and USP interoperability, QA Café has been involved in all three USP plugfests to date, adding a familiar continuity to the events. Axiros is proud to have been involved in all three events as well. Daniel Egger, our embedded technology genius, and teammates from Europe have been involved in all three USP plugfests. This year marked North America’s second showing, and this week we are proud to also have a member of our Latin American team in attendance, as well as our Chief Technology Officer, Marat Azizov. Technologists from AVM GmbH, also based in Germany, were present for the first time, evidence of the growing interest and investment in USP. The testing of USP Agents and Controllers was accomplished by the pairing of plugfest participants. During one cycle, for example, Axiros would test its USP Agent with another member’s Controller. In another cycle our second Axiros team would test its Controller with a different participant’s Agent. 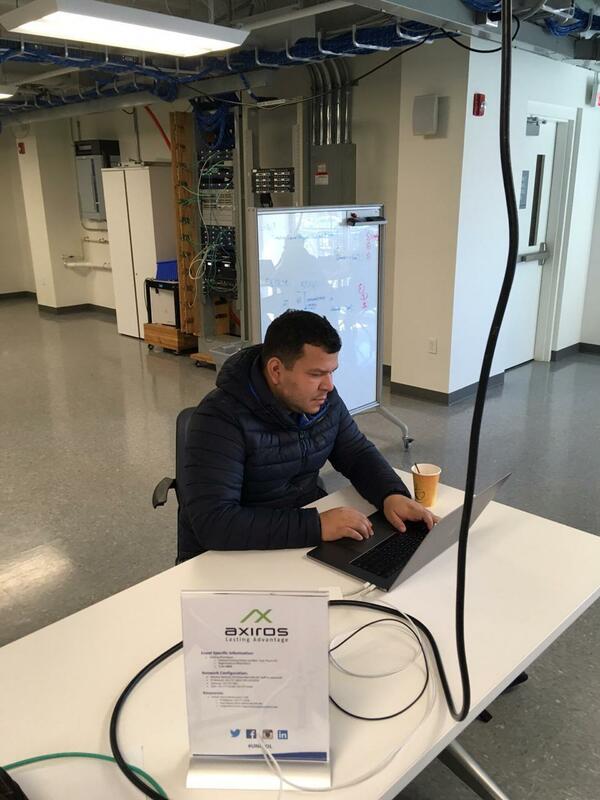 Rafiq Mateen, from Axiros North America, was onsite for Controller testing, while Willer Moreira from Axiros Brazil took our Agent through the paces. Together with Daniel and Marat across the Atlantic, the Axiros team was able to work with many of the other participants, the model followed by other plugfesters. The interaction among the participants is a key factor in the maturation of the standard. With a gestation period of approximately three years, USP is alive and thriving thanks to the hard work of the Broadband Forum, its members, the expert staff and inspiring students of the UNH-IOL. With another USP plugfest in the planning, the “state of the standard” is now firmly rooted, and industry investment is paying off. The multi-controller, multi-transport capable attributes of the USP standard make it a powerful tool for a wide range of applications in telecommunications, home automation, smart cities and the Internet of Things. More information about USP is available through the Broadband Forum and from Axiros. Parties interested in becoming active in future plugfest events can use the Axiros website to sign up for active notices or follow news from Broadband Forum or the UNH-IOL. Michael Shaw | CEO, Axiros North America Inc.